Facebook has nearly 1 billion users, but a good chunk of them are clueless when it comes to using the social network safely, a new study conducted by Consumer Reports has found. Consumer Reports projected its findings after questioning Facebook, security experts, privacy lawyers, app developers, and victims of security and privacy abuse as well as surveying 2002 online households, including 1340 that use Facebook. The findings are pretty telling. Oversharing is common. A projected 4.8 million Facebook users have publicly indicated where they planned to go on a certain day even though doing so could tip-off thieves, stalkers, or others with nefarious intent. Another 4.7 million "liked" a Facebook page about health conditions or treatments, in spite of the fact that insurers could use that data against them. Millions don't use privacy controls. Nearly 13 million users have never set or don't know about the social network's privacy tools. And more than a quarter of users have shared their wall posts with an audience broader than their friends. Data is a premium to Facebook. "It is very likely that no government or corporation has ever managed to gather such a huge amount of personal and often highly sensitive data," said Max Schrems, an Austrian law student who retrieved 1222 pages worth of his personal information last year from Facebook. Among them he found wall posts, messages, e-mail addresses, and friend names that he had previously deleted from his account. Third parties can see your data. Many Facebook apps garner data about users' friends. That means even if you don't use a particular app it could have access to your data just by way of one of your friends who is using it. U.S. privacy laws are lax. Good luck getting your hands on the full bevy of information social networks have on you, at least if you live in the United States. That's because online privacy laws in the U.S. are generally weaker than those in other places. Problems are escalating. Eleven percent of respondents, or a projected 7 million households, said in 2011 they had experienced a problem with Facebook such as being harassed or someone else logging into their accounts without permission. That's up 30 percent from last year. The Consumer Reports findings agree with other studies recently conducted. For example, according to the digital branding firm Siegel+Gale, even after reading privacy policies most users of Facebook and Google still don't understand how the websites handle their information and how other Web users can discover it. 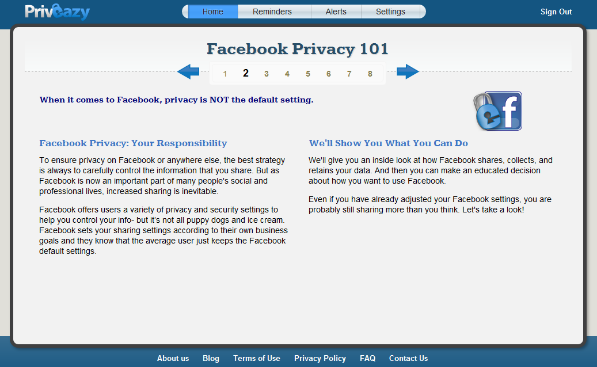 Want to make sure you're not counted as one of the clueless when it comes to Facebook and privacy? You might try a new tool called Priveazy which makes use of lessons, quizzes, and tasks to educate users. For example, using Priveazy you can watch a video that explains how Facebook collects your data, take a quiz to see how much you understand its data collection practices, then take steps to lock down your privacy settings.